Following leads from Agents Amelia, Laura and Karl, we now have a prime suspect, and I am hot on the heels of the Potter Wasp or Mud Dauber Wasp. This erstwhile squatter, who thinks she can build residences for all her offspring just wherever she pleases, still remains at large – but the evidence is mounting. Further sleuthing has turned up more mud structures. 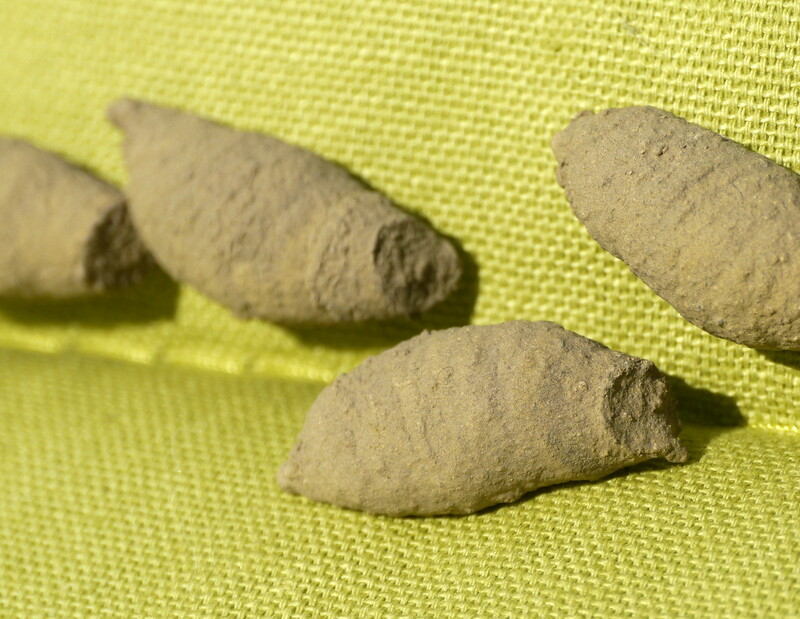 These dubious looking pods were found in the shed attached to a garden chair cushion. Needing said cushion necessitated their removal – they wern’t stuck too tight and I took the liberty of breaking through the crisp skin – only to find it packed with little spiders, some still alive. So, my fiendish quarry is not averse to incarcerating her victims alive – what a horror bag! 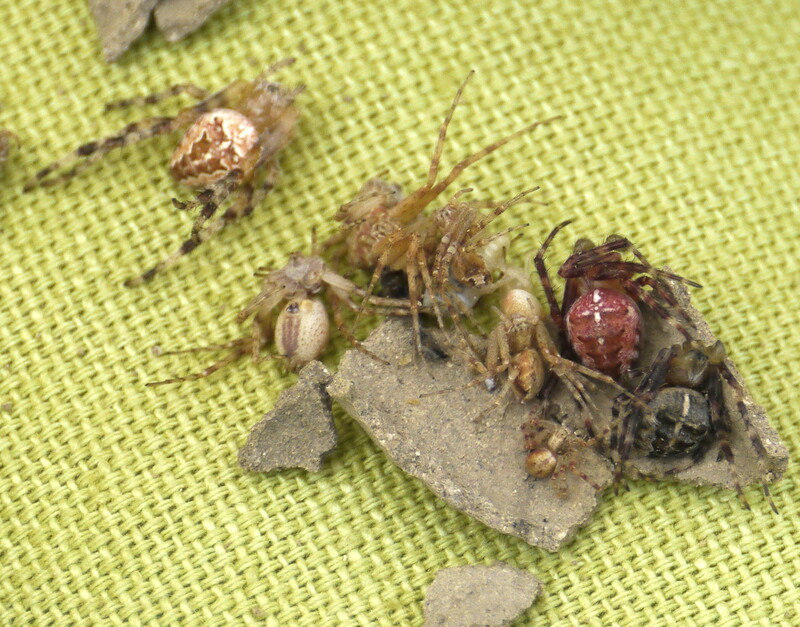 The wasp will have stung these spiders to paralyse them before dragging them off into their Cell of Doom. 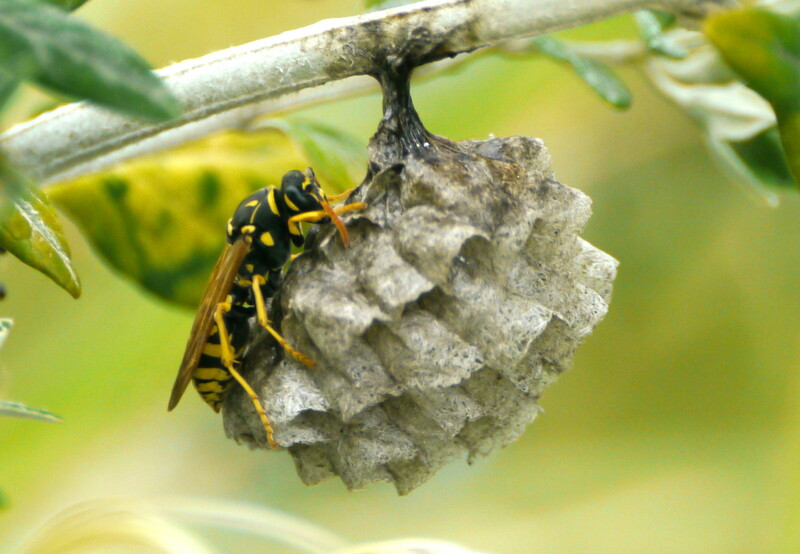 And then the wasp will have deposited a single egg, and sealed up the nest pod. The larva then has enough handy food to sustain its development into adulthood. As is typical with most things, when you actually WANT to find wasps, there are none to be seen. I did track down this possibility, but it seems that she has a different MO. I would dearly like to capture Madame Mud Dauber red-handed, in flagrante delicto – the pursuit continues. ← Who lives in a house like this? Creepy, creepy, creepy. I’m not sure I want any more photos of this ruthless little beast’s meals. I like spiders and this is not a good end for them. I’m pleased you saved a few. Oh yeah, wasps deserve to live too, but can’t they be a little less creepy when doing it? Eeeeewwww. Providing scrummy honey or even royal jelly for one’s young seems a much more civilised way of going about things. These wasps should take a lesson from the bees. I love your style. You gotta find out what is in there – so you look. That seems a lot of food for a little baby. Or is the baby going to be bigger than you think… You could put some of the mud structures in an incubator (i.e. a large bottle with a pierced lid – pickled dill comes in a convenient size – let’s keep it scientific) and see what hatches out. Good thinking, Agent Amelia. I have unearthed my old, white lab coat, fettled a suitable incubator (confit de canard jar) and transferred some of the pods. I’ve put it in a cool, dark place where I can keep my eye on it – but far enough away so I can’t hear the little spiders crying out for help. Wikipedia helpfully (?) states that pupation may last a few weeks or over a year! Let’s hope its the shorter time. That explains why those mud pods seem to last forever wherever I see them. I have assumed in the past that the babies died because they just sat unmoving for so long. What doe 1 year old dead spiders taste like I wonder. For the taste of old spider, I am happy to never know – its probably no better than fresh spider, just crispier. Eek, I would have screeched when I found those spiders. Hello everyone. I have been enjoying all this writing above and it is the way nature works. I hate to be horrible but we are not saints either are we? I enjoy a good roast dinner very much and it didn’t get on my plate by magic. We shower most things with dreadful pesticides and doses of antibiotics and call it taking care of….. Sorry I don’t mean to be such a wet rag…. I guess I’m trying to be an honest realist. I love spiders too and would never harm one intentionally. I always remove them gently if I find them in my house, but if one of my bees got into a spiders web I would be very upset with that spider even if my bee was meant to be her roast dinner. I agree, one can’t be too sentimental about nature and food chains. If I had to choose between a spider and a wasp, it would be a hard choice – they neither score highly on my Scale of Cuteness. On the other hand if it was a choice between a spider and a bee – then that would be a much easier decision. I’m not a vegan so I can’t really judge wasps who take such good care of their babies. What I object to is burying an insect alive for the baby wasp. I’m sure there’s a good reason not to kill it, but eeek. Honestly, I feel the same what about live lobster in a tank at a restaurant or shop. Their claws taped closed and all piled on top of each other. How anyone can eat such distressed meat is beyond me. I believe meat should be humanely raised and quickly and humanely killed before consumption. Being trapped in a mud cocoon for days/weeks/months just ain’t humane. But then wasps aren’t human so I’d best leave them to their successful ways. As for bees, I’m with you there. I really hate to see one of my bees all spun up in a web. Those ladies work so hard in such a self-sacrificing way, I’d like to think they all live to a nice retirement where they move to the tropics and drink mead by the pool. Nature – harumph.